Bengaluru was once proudly known as the ‘City of Thousand Lakes’. But today, most of the city’s water bodies are unfortunately staring at extinction. While citizens continue to urge the Government of Karnataka to take cognizance of the disaster in the making, there is one official silently doing his bit to protect Bengaluru’s lakes. Namma Bengaluru Awards Government Official of the Year 2016 Jagannatha Rao has for decades now tirelessly worked towards protecting Bengaluru’s environment, especially the lakes. Working in the capacity of a Deputy Conservator of Forests and Lakes with the Bruhat Bengaluru Mahanagara Palike (BBMP), he has over the years evicted encroachments and fenced 48 lakes in the city. 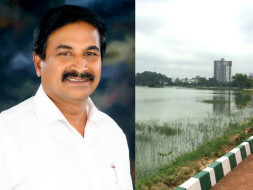 Not just that, Jagannatha Rao is also actively involved in educating the local communities and engages them in preserving and maintain the lakes. Last year, Harlur’s Kasavanahalli lake was added to the ignominious list of lakes in the city that froth. However, citizens took the onus to clean up the lake and restore it. If #Bengaluru helps Jagannatha Rao to raise Rs 2 lakhs, he intends to utilize the funds to add a public toilet facility at the lake and provide a dedicated borewell for sufficient water requirements at Kasavanahalli lake. He also intends to utilize the same for watering the plants all around the lake. His plan also includes installing a drinking water kiosk at the entrance of the lake. Beyond money – Jagannatha Rao needs your help in spreading the word. - Educate others on his initiative and encourage them to share details on various social media platforms. - Become an active citizen and work towards the cause of reclaiming and protecting Bengaluru’s lakes.